We offer 3,000 part-time courses in a wide range of subject with a mixture of qualification and leisure courses to over 20,000 learners annually. Birmingham Adult Education Service is one of the largest providers of adult learning opportunities in the West Midlands and each year over 20,000 adults choose to do courses with us. The majority of these adults are over 19, though we can accommodate 16-18 year olds as part of their study plan. Our greatest asset is our staff and their skills, experience, professionalism and dedication. That’s why our learner satisfaction ratings have been consistently high over the last 5 years. In our latest Ofsted survey 97% of current learners said they would recommend our classes to a friend or family member. We annually run nearly 3000 courses in a wide range of subjects with a mixture of qualification and leisure courses. Our courses are available across a range of levels suitable for the absolute beginner through to advanced. Many people come to us to improve their employment prospects through training for a new career or improving English, Maths and IT skills. Others develop skills in a new language, with more than 25 on offer this year from Arabic to Welsh. We run courses in the following subjects. Many of our courses are free or have discounts available. We provide Information and Advice for those who need help finding the right course or planning a career. General information about all courses can be obtained by calling our Information Line on 0121 303 4318. We have over 30 years of quality approved experience in teaching adults to become more confident in reading, writing, maths and spoken English. Improving these skills can be the beginning of the road to achieving your long term goals. You will be taught as part of a small group and will have an individual learning plan that is tailor made to suit your learning goals. BAES offers an unrivalled range of language courses. Brasshouse Language Centre offers you the choice of 30 different world languages to learn. Whether you are hoping to learn a language to use on holiday or when travelling, with friends and family at home, or for work in the UK or abroad we have the course for you. Our childcare and classroom work qualifications can open the door to a variety of careers, ranging from playwork and childminding to nursing. Alternatively you may wish to follow the route leading to gaining work in a school environment supporting children and teachers. Childcare courses will prepare you for jobs involved with caring for babies, toddlers and pre-school children in a nursery or daycare setting. Classroom Work courses will prepare you for work as a Classroom or Teaching Assistant, where you would be supporting the teacher with their everyday work. Working as part of a team you would help with the planning of learning activities and provide a stimulating learning environment. Using a computer is now an important life skill. More and more of us use Social Media like Facebook, e-mail and Twitter to stay in touch with family and friends. Our courses are suitable for those who are interested in developing their business and computer skills. Our courses are suitable for the absolute beginner through to the confident IT User who wishes to develop advanced level skills. The choice and variety will give you a wealth of opportunities to turn your passion, talents and interests into a career. You can choose from hundreds of courses which include drawing and painting and art appreciation, beauty therapies, crafts, dance and music, jewellery making, floristry, interior design, photography and digital media, pottery, sewing skills, cookery and cake decorating and sugarcraft. Our learners have used these courses to help them take the first steps towards getting a job, setting up their own business, or as a stepping stone onto teacher training or further study. Think you could start your own business? Not sure you have the knowledge to make it happen? We can help you take your first steps towards working for yourself! Our Business Enterprise Days are an opportunity to take a big step towards turning your ideas into reality. Come along and find out about self-employment, network and speak to others who have actually done it. These events are free and aimed at anyone who has a business idea or is thinking of looking at self-employment as a career option. Birmingham Adult Education Service is offering a range of new courses to support those wishing to take their first steps into becoming self-employed. If you would like to attend or for further details please call us at 0121 303 4318. Birmingham Adult Education Service offers a welcoming and safe environment for you to discuss your learning needs. We understand that our learners have differing needs and some may require extra support to achieve their learning goals. Assessments to identify specialist equipment or resources needed e.g. large print, hearing loops, computer equipment and assistive technology. BAES welcomes learners with disabilities. Our staff are well trained and understand the needs of learners with disabilities and learning difficulties, including dyslexia. The Learner Services team may be able to help with specialist resources and equipment to support you on your course. We run workskills and pre-employment training courses in many of our centres and you may be able to enrol on one of these alongside other courses. We can also link you to Job Clubs that will help you look for work and prepare for employment. Our English, Maths & ESOL courses can also help you develop skills needed for employment. If you would like to discuss your options further with a member of the Learner Services Team, contact details are listed below. Brasshouse Language Centre is part of BAES, Birmingham Adult Education Service and the place for language courses and services in over 30 languages. Brasshouse Language Centre is the largest Adult Education Centre in the UK specialising in language courses and language services. The staff and students from all over the world bring a wealth of knowledge and experience to the centre and create a dynamic truly international atmosphere. Our English classes cover a wide range of language skills and will help you to use English more confidently and effectively. Our highly qualified and experienced teachers and the relaxed and friendly atmosphere is class guarantee that you learn and have fun at the same time. We have classes at all levels from Beginners to Advanced. You can study General English or prepare for international exams like PET (Preliminary English Test), FCE (First Certificate in English), CAE (Certificate in Advanced English) and IELTS (International English Language Testing System). We interpret between English and most world languages. We also offer advice and consultation on communicating effectively with people with disabilities such as hearing impairment or sight loss. The Accessible Information Service provides facilities for converting text into other formats such as Braille or MOON. Our specialist language advisors are available to speak to you in person (no appointment needed) to give information, advice and guidance in all aspects of your language learning, including courses, fees, progression routes, accreditation and extra curricular activities. Alternatively you can ring 0121 303 1626. We offer you a welcoming and safe environment in which to discuss your learning needs. We ensure that the information given is impartial and confidential, and will refer you to another provider if necessary. We have specialist staff based at Centres throughout the City who are there to help you make the right choice and we offer a range of support to help you succeed - specialist support for learners with disabilities; additional English and maths; advice on funding and childcare. 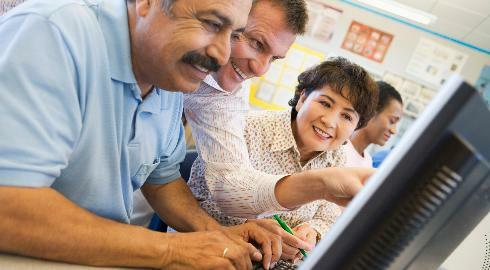 At Brasshouse Language Centre we offer professional development and teacher training courses. This is the basic qualification you need in order to get a job either in the UK or abroad. This course is designed for qualified teachers who have several years of teaching experience and want to further their career. Thinking about learning something new? Want to improve your skills for work? Come along and find out about the courses starting in September at your local Adult Education centre. Music, Dance & Fitness: These courses are for those looking to improve their own health and well being, or maybe you just want to relax, have fun, and meet new people. Joining a Yoga, Tai Chi or fitness class could help you to reduce stress, improve fitness and maintain a healthy lifestyle. Whatever your level of fitness there should be a course to suit your needs, whether stretching, toning, dance exercise or something gentler. Guitar, Singing, Keyboard Ukulele, Badminton, Self Defence, Yoga, Karate, Tai Chi, Keep Fit, Body Balance, Salsa and Ballroom. Personal Development: If you think you have the skills and personal qualities needed to look after and support children and adults these courses will start you on the way to working in this profession. These skills are valuable for many careers such as management, nursing, teaching, care work & many others. These courses can improve with the understanding of human behaviour, communication and listening skills, self awareness and emotional intelligence, and relationships with others. Assertiveness, Confidence Building, Health & Safety Awareness, Managing Stress, Mental Health Awareness, Nutrition & Health, Principles of Dementia, Safeguarding, Substance Misuse Awareness, Disability Awareness, Alcohol Awareness, Counselling Skills, Mentoring, Health & Social Care, Childcare & Classroom Work. Business & IT: Most jobs today expect people to be able to use a computer to do some key tasks. If you need a qualification to gain or move jobs and show your level of skill, then one of our IT courses can help you achieve your goal. Our accounts courses can improve your current office based skills or be used as first steps towards a career in book-keeping and accountancy. Want to start your own business? We can help to develop your business skills and confidence on our business enterprise courses. Touch-typing, Web Creation, Internet & Email, Facebook & Twitter, MOT your PC, Internet Safety ASCENTIS, Setting Up, Business Administration, Team Leading, Customer Service, Job Skills, Book-keeping & Accounts and Computerised Accounts. Creative Crafts: Courses range from jewellery making to sugarcraft, art to pottery will help you to learn new skills, or develop skills which could lead to you being able to exhibit or even sell your work. Qualifications in these courses can give opportunities to turn your passion, talents and interests into a career. Sugarcraft & Cake Decorating, Baking, Food Safety, Cookery in different cultures, Clothes Making, Upholstery, Crochet & Knitting, Creative Crafts, Pottery, Jewellery Making, Floristry, Art, Digital Media. Leisure: Have a hobby, interest or just want to study something new? Then one of our leisure courses might be just for you. The courses on offer could prove to be a good starting point for developing your knowledge and skills further, platform for further study or just a first step that could lead to further opportunities with other providers. Creative Writing, , History, Find your Family Tree, Calligraphy, Massage, Hair & Makeup, Mehndi. Main Subjects: These courses are for adults who want to become more confident in reading, writing, Maths and spoken English. Improving these skills can be the beginning of the road to achieving your long term goals. All of our courses cover the English & Maths and skills you need in everyday life and work. If English is your second language and you need to build your confidence in speaking, listening, reading and writing, an ESOL course may help you to get on. English, Maths, Biology, Human Health & Physiology, Languages, British Sign Language. Marie missed long periods of her schooling when she was young due to illness, as a result she has struggled as an adult with reading and writing. Six years ago she came to one of our centres to improve her skills as she wanted to help her grandchild with their homework. Although Marie was diagnosed with dyslexia, she has perservered and is now gaining literacy and numeracy qualifications. The learning bug has really bitten Marie and she has added computers and jewellery making courses to her list of skills. She always enjoys coming to lessons and her love of learning is obvious to all. Safia and Mirage are both deaf and enrolled on the Mehndi beginners course in September 2012. Initially a support worker attended with them but both women have adapted so well to their learning environment that they now attend alone. They have both shown great commitment to developing ways to communicate with their tutor and they are now acquiring the skills and knowledge needed to succeed. They continue to make excellent progress and their creative skills have improved significantly. They both intend to progress onto the advanced level. John left school with no formal qualifications. He has been studying Mandarin now for 4 years and last year gained a A* in GCSE. John's commitment to the course and his love of the language is apparent to everyone. His confidence since starting to learn the language has greatly improved and his achievements in the subject are an inspiration to us all. Diane has been an inspiration to watch develop as a person in her class. Her dedication and determination since starting her Karate training has been outstanding. As one of only two female learners in the group she has already battled through to achieve the level of Orange belt. She never misses the chance to stretch her skills with more experienced students but always has time to help the less experienced too. She is a dedicated learner who is enthusiastic in all she does, she has put everything she has into further developing her karate skills. Back in 2010 Nusrat came along to her daughter's Primary School to attend an Art Attack course. Having enjoyed the course she spoke to the Family Learning Organiser who helped her believe that she was capable of pursuing a career in something she was interested in. First step was to enrol onto a Teaching Assistant level 1 course and now this year she is completing her level 2 qualification. Although a busy mum with 2 children at primary school she has also managed to find time to achieve a level 2 Maths qualification and complete a Computers for work course. Her confidence and self belief has grown and now she is ready to start a career doing something she loves! George has a diagnosis of autism. He has attended pottery and art classes at Stone Hall and Sparkhill Centre. Recycling materials such as packaging, glass and plastic is one of George's passions and he has found inventive ways to incorporate this into his artwork. As a result of this interest his tutor nominated him for the BCC Recycling Award where he won first prize. To overcome this learning difficulty and incorporate and express this passion so effectively through his art is extremely impressive. Chloe had an less than perfect education as a child and as a result was not very successful at school. However, back in September 2010 she decided to do something about improving her skills and joined her first Adult Education course. She started with basic English, Maths and Computers and has steadily worked her way up to the point where she is now taking her English GCSE and completing work-ready Computer qualifications. Chloe's ambition is to be a Adult Education tutor in Literacy and she is determined to overcome her visual impairment and dyslexia difficulties to achieve this goal. Louise has 7 children. She has never worked and most of her adult life has been spent raising her family. Louise came along to a computer course as she wanted to support her younger children with their homework and keep up-to-date. It wasn't easy at first and she struggled to participate in the class, she looked like she may give up! But with the support of her tutor and determined to show her children she could complete the course she started to excel and is picking up new IT skills all the time. The computer courses are opening up a whole new world of opportunities for her and she would now like to start a social care course. A few years ago Shehnaz started her learning journey with us on a Childcare level 2 course. She was a keen, dedicated learner who worked hard while on her course to achieve her qualification. She progressed onto a level 3 course with another provider but kept in touch with her tutor. Last year Shehnaz returned to us to study the Assessors Award where she has worked with a selection of our current childcare learners. She has been a great mentor for these learners and has done a lot of work for our service on a voluntary basis. This has not gone un-noticed by her own assessors who have commented on her commitment and how much she has given in support of others.